Following a decent performance at the Farnborough half marathon and Bramley 20 early in 2017, I took the decision to undertake a marathon for the first time whilst I was still fit and injury free (I had back surgery 2 years ago and I’m not getting any younger). The New Forest Marathon caught my eye in particular – an autumn race which meant all the training would be through the summer, fairly flat (sort of) and a fantastic scenic route through the forest. As the training mileage ramped up, bits started falling off my previously indestructible body resulting in a number of trips to the physio and having to start my taper 6 weeks out from race day rather than the usual 3-4. Race day finally arrived, a nice cool morning with cloud cover and a breeze forecasted – perfect conditions. At the race registration tent, I managed to catch up quickly with Dave Bartlett and his daughter who had arrived to tackle the half marathon and met a colleague from work who was also tackling the marathon. The route takes you out of the New Forest Showground and straight into a fantastic forest enclosure on hard gravel tracks and eventually onto the Rhinefield Ornamental drive past the heaviest and tallest trees in the country (these are all nicely sign posted along with a few quotes to keep the runners amused). I concentrated on starting slowly and easing into a steady, manageable pace. At around 10 miles I made a comment to the guy running next to me about the fantastic scenery which resulted in the guy in front of us jokingly asking if we were referring to his backside!! The 3 of us ran together chatting for the next few miles, tackling the first of the serious hills – a long drag from Brockenhurst up to Sway village. We eased through the half way mark in 1 hour 39 minutes – all on track so far and feeling good. As the route passed Sway Village and turned into the Setthorns enclosure the real trouble started – bigger hills and lots of mud! Just maintaining the current pace was quickly becoming very challenging. As each mile passed the mud got worse, severely sapping my energy and at mile 18 in the Wilverley enclosure we were presented with the biggest climb on the course which most runners chose to walk up (I ran slowly as I wasn’t sure I’d start running again if I walked!). Another 2 miles of forest and mud followed (by this point I’d seen enough forest, cows, horses, ponies and donkeys for this year!) and eventually I emerged onto the Burley Road. I knew from the course map that I had around 5.5 miles left and most of it was downhill or flat. Thinking this was the part of the race where I’d grit my teeth and run for the finish I quickly found that my legs had turned to concrete and I could barely run at a snails pace (with significant discomfort in my quads, hamstrings and calves) – arrgghh!! Despite carefully planning my pre-race and in race fuelling, I’d hit the dreaded wall! As each remaining mile dragged on I was running slower and slower and the pain in my legs was getting worse. At mile 23 I was convinced I had blown my sub 03:30 goal time and had mentally almost given up. I was very despondent at this point in the race. With around 2 miles to go I checked my watch and it dawned on me that I was actually closer to the finish than I had thought (the tree cover was playing havoc with most people’s GPS watches) and after a quick mental calculation I realised that if I could pick up my pace just a little I could still achieve my goal time. 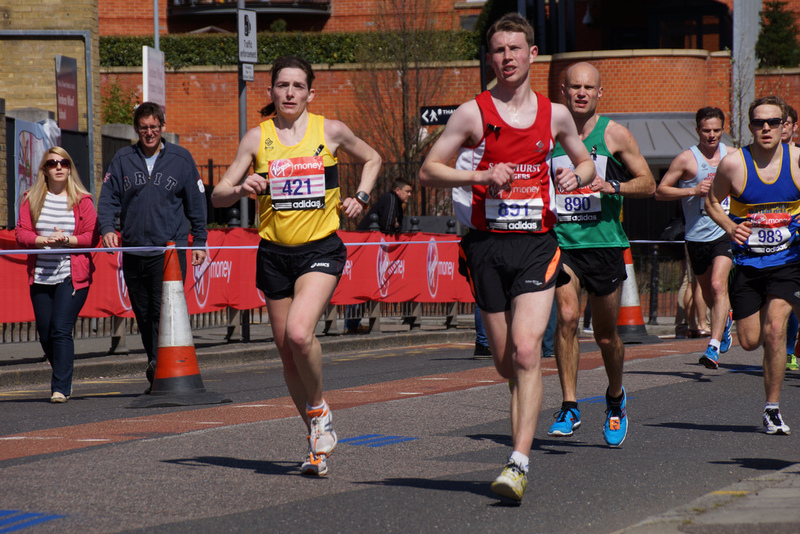 I shouted at myself once or twice (startling a runner near me!) and mustered all the energy and determination I had left to haul myself to the finish. The course had merged at this point with the half marathon and 10k roiutes so there were a lot more runners around me. In the distance I could hear the announcements at the race village – I was getting closer but still slightly confused as to whether I was on target or not. The route took us over a picturesque wooden bridge at the Lymington River and I soon spotted the 9km marker (part of the 10km course). A quick time check confirmed I had 8 minutes to cover the last 1km – I was actually going to do it! Forgoing my usual sprint finish (I could barely run in a straight line at this point) I crossed the line in 3 hours and 27 minutes and was quickly congratulated by Dave Bartlett who’d ran a superb time for the half marathon. Although the 2nd half of the marathon route was hillier and a lot muddier than I expected I would recommend this race to anyone looking for a slightly different marathon – the scenery was amazing. The moral of the story……never EVER give up during a race (I could easily have dropped my head and started walking) and it’s probably not a good idea to pick a hilly / muddy race as your first (and last) marathon!